I took a flight out of Medan, Sumatra to the island of Lombok. Lombok is the next island from Bali, to the east. 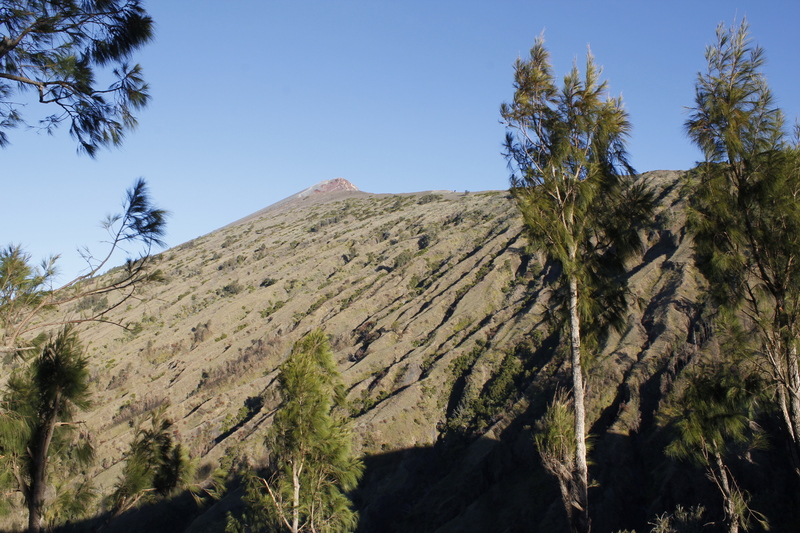 A lot of wonderful places to visit on this island (from what I hear) but I only had time to do one thing and that was to climb Gunung Rinjani, the second highest volcano in Indonesia. It is a very hard climb that not everyone is able to finish but I was determined to do it! Before landing in Lombok I had gotten a couple of quotes for a 3-day/2-night trek on the mountain but they seemed very expensive so I decided to get to the town of Senaru, at the base of the mountain and get some more quotes there. I went to find out about transportation to Senaru at one of the tourist information desks at the airport. 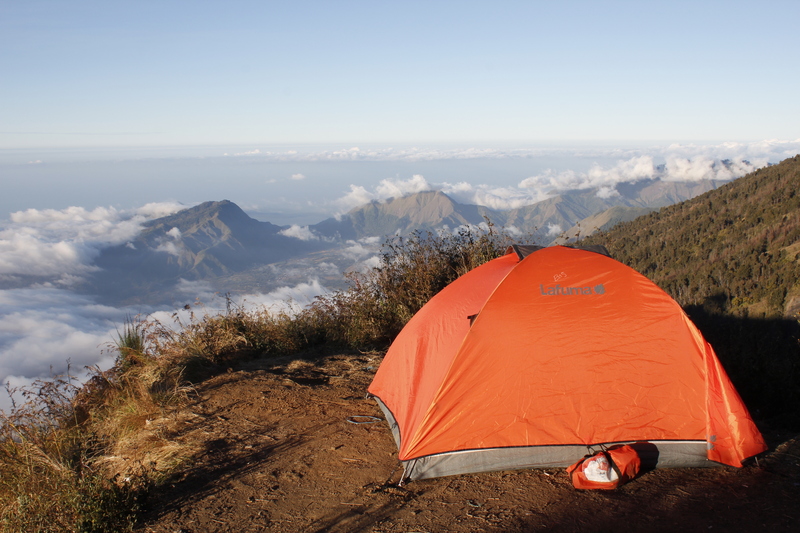 They actually offered a reasonable price to trek Rinjani (plus transport) so I decided to book it all with them and begin my trek the following day. 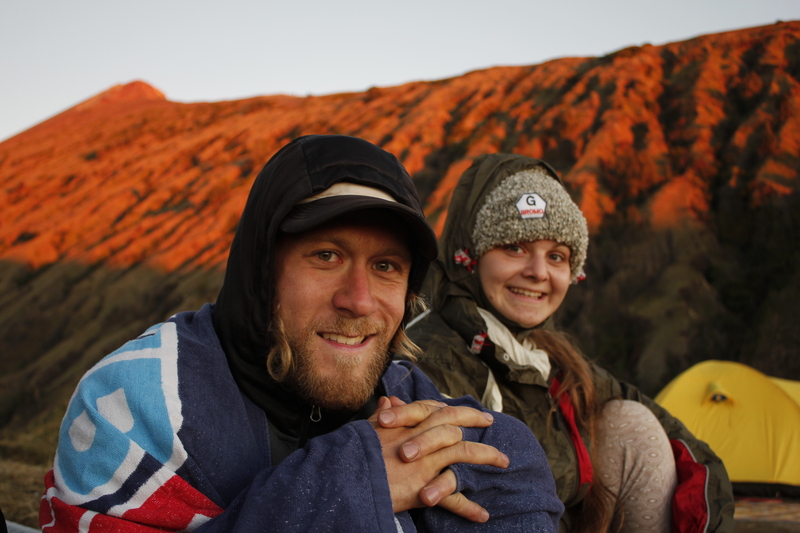 I stayed one night in Senaru and met my Rinjani group: Jesper and Maaike from the Netherlands, Vincent from Quebec, Thomas and Peter from Malaysia, Julianna from Austria and Tim and Tonya from Australia. The following day we started our journey at around 8:00 am and drove to the Rinjani trek center in the village of Sembalun to register and begin our trek by 10:00 am. The first day was a beautiful and rather easy hike through savannah grasslands, up and down hills for about 7 hours. We began at an elevation of 1100m (3,630ft) and our destination for the first camp was 2638m (8,705ft) on the rim, right at the base of the summit. We reached our campsite where we had spectacular views. 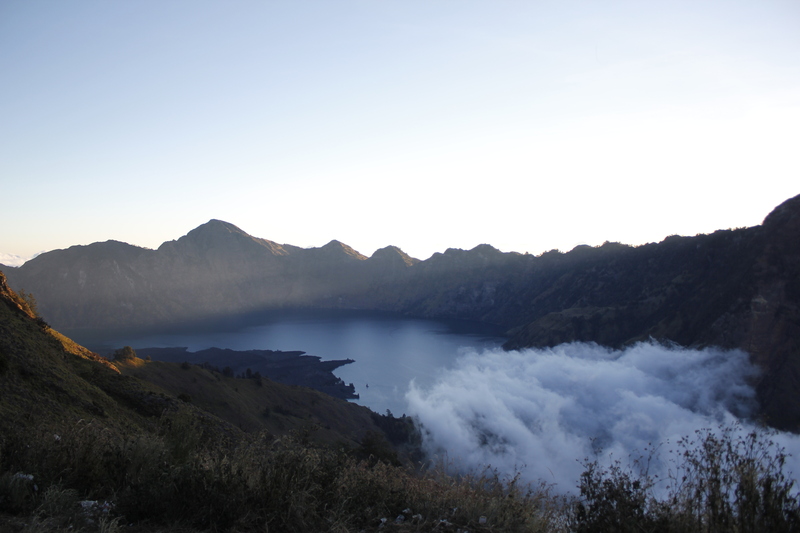 We had on the one side a perfect view of the summit and on the other side the immense caldera sitting 600m below the rim and inside, the beautiful blue lake, Danau Segara Anak. We enjoyed an amazing sunset from here while we waited for our dinner to be ready. Yes, the package included full tent set up, all 3 meals, water, guide and porters. Luxury living on the mountain! The next morning we woke up at 2:30 am to begin our ascent to the summit by 3:00 am. We climbed a total of 1100m (3,630ft) in about 3 hours in very difficult loose volcanic rock and scree. Luckily I had rented poles and managed to not slide around too much on the way up. It took me about 20 minutes longer than most of the group to reach the summit as I forgot gloves and had to stop literally every two minutes to try to get the feeling back in my fingers to be able to hold onto my poles. The wind was very strong and it was very cold! The views from the side of the mountain, right before the summit, were absolutely incredible at sunrise. I was finally able to reach the others at the summit and enjoyed spectacular views of the caldera, Lombok and the near-by islands and volcanoes, including Mt Agung in Bali (see old post on this climb) and the three Gili islands. After 20 minutes of being at the top I descended back to camp where we had breakfast before commencing our long and grueling journey down into the crater to enjoy the hot springs and lunch at the lake and then back out to the rim to spend a second night on the Senaru side. 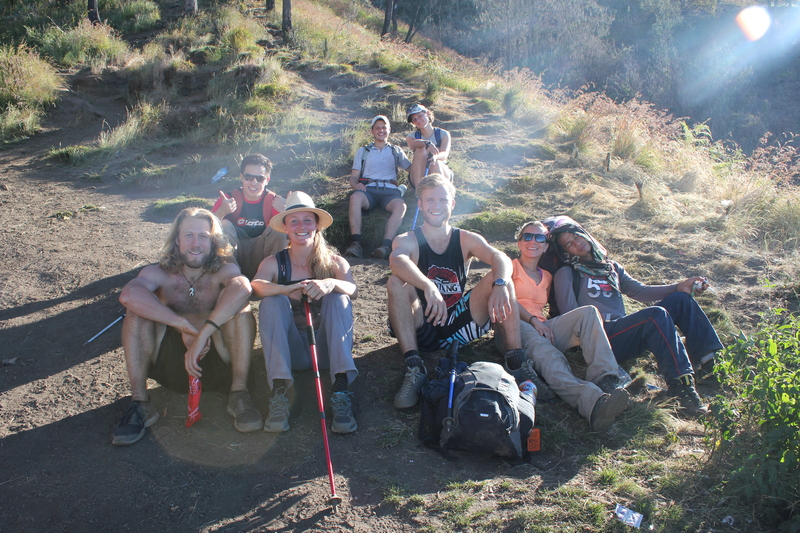 We hiked a total of 15 hours (including the lunch break) that day up and down on rocky and steep terrain. The last day we hiked out through the Senaru side through lush forest. This was one of the most challenging and best hiking trips of my life! We had a great group of hikers, led by our fearless guide Aldo and his friend Anton and the four porters that made it all possible. Thank you for an unforgettable trip! Celebrating the end of our hike! My new friend Vincent and I enjoying the views from our first camp site at the base of the summit. Our guide Aldo who always said “continue, continue” whenever we were happily resting. The porters making lunch for us on the first day. The group taking a break before lunch. Views from the ridge, coming down from the summit. I made it to the summit! Enjoying dinner and drinks at the bar Legend. Jesper, Maaike and Juliana enjoying the sunset. The ride on the public ferry to Gili Air. They pack these to the max! 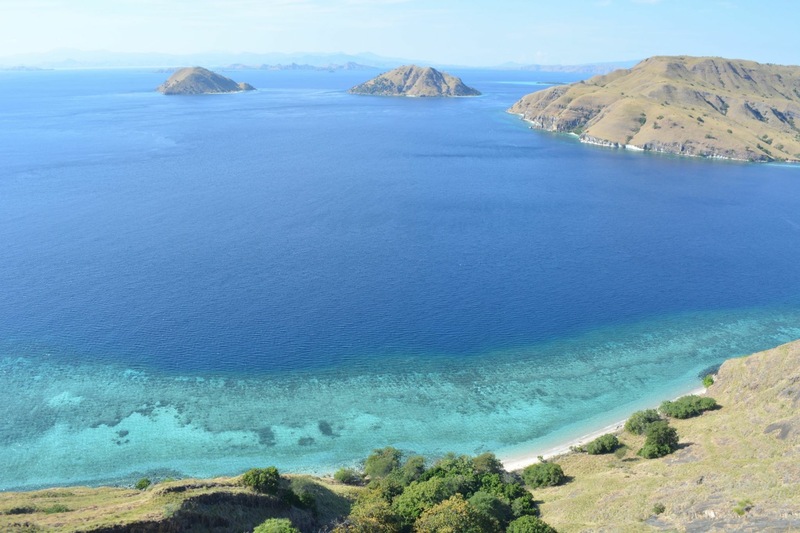 Besides climbing Rinjani, the other adventure that was high on my list and that I had to complete before leaving Indonesia was the 4-day boat trip from Lombok to Komodo National Park and Flores. My friend Vincent wanted to do it as well but he had to go earlier than me… first I had to make sure I fully recovered from my stomach illness before getting on a boat. I booked my trip while I was sick hoping that the antibiotics would take effect fast and thankfully they did. 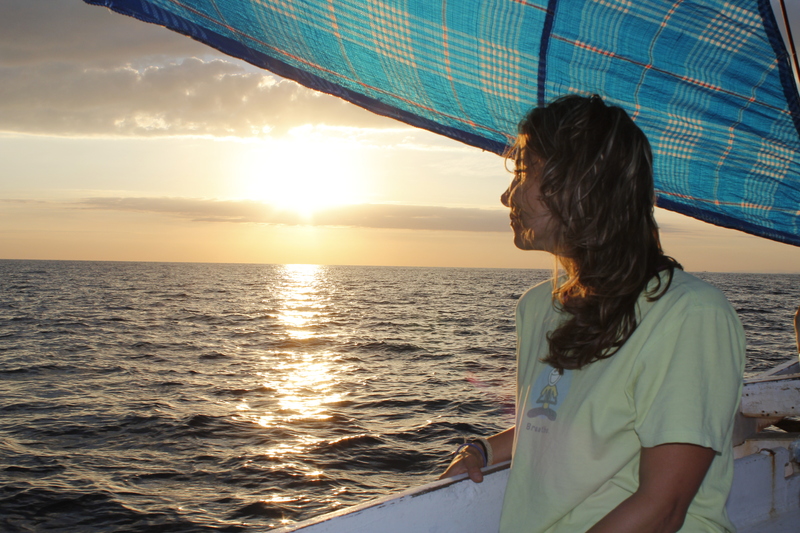 I met a group of 20 people in the port of Bangsal in Lombok four days later where we boarded our small boat. It had a common area for sitting and eating, the front deck where we could sun-bathe, one tiny bathroom, two private cabins for two couples that paid much more for this added comfort, the captain quarters and the tiny sitting area in the back of the boat where the crew managed to cook and wash dishes (and sleep?). 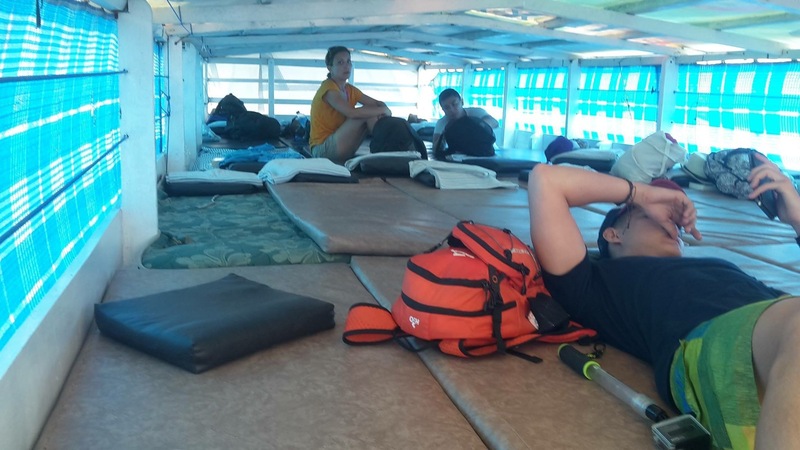 There was a small upper deck where the rest of us (16) slept in small mattresses, positioned one next to each other. It was a true mental challenge to avoid getting sick from the constant rocking of the boat. Somehow I managed not to puke; which is an accomplishment for someone that usually pukes 3 to 4 times on the one-hour trip from Long Beach to Catalina island in California. I read a lot; which really helped. Thankfully the boat seemed well equipped for safety with life jackets for every passenger (I counted them) and a radio and GPS unit (according to the Captain). We were a fun group of various nationalities: Germany, Belgium, France, Netherlands, Spain, Indonesia, Australia, Canada, the UK and Colombia/US (me). 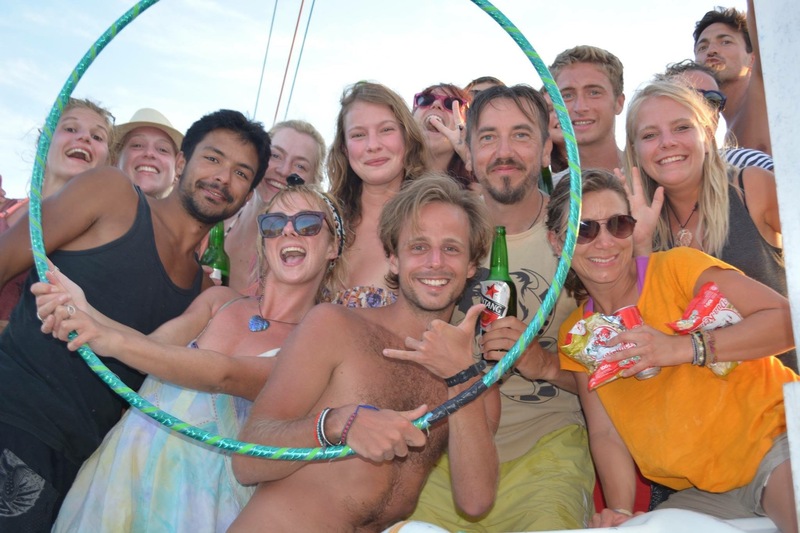 Our time on the boat consisted of sun bathing, reading, listening to music on a portable speaker, telling life stories, and watching Michelle, the English girl, entertain us with her hoola-hooping. She was truly a pro at it and very fun to watch! The boat had scheduled stops at various islands during the four-day journey: Moyo, where we got to hike to a nice waterfall and wash in fresh water. Satonda, where we hiked up a mountain to a nice view point and did some snorkeling. Laba Point, where we got to swim in a large, beautiful lake and hike up another mountain. We made a stop in the middle of the open ocean to try and chase a small Manta Ray that someone had spotted. We also saw a black tip reef shark; which swam right below me at one point. It was really exciting to see my first shark! 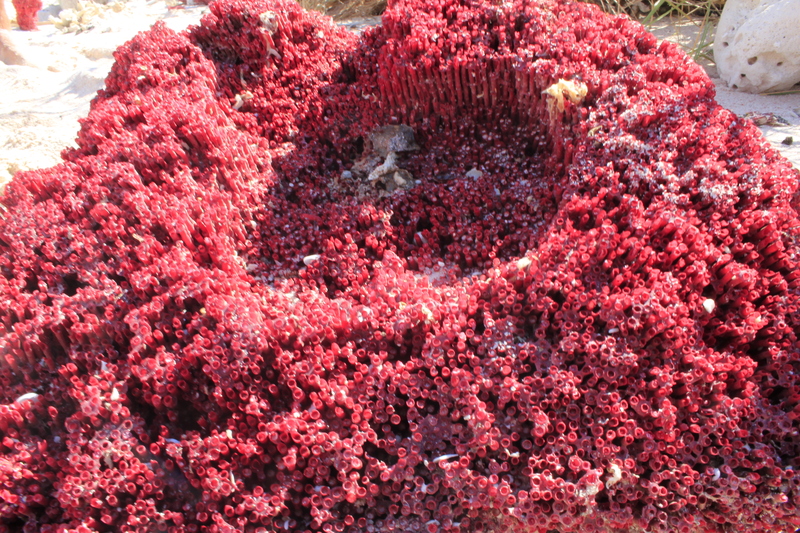 We visited Pink Beach; which gets its name from the pink coral that is found there. 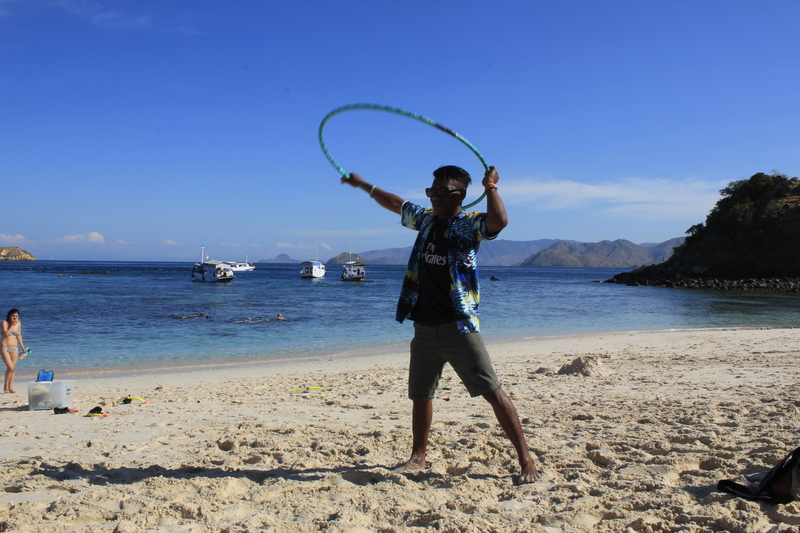 We relaxed on this beach for a while drinking beer and watching some Indonesian boys try hoola-hooping with Michelle. At every island stop we would have to swim from the boat to the shore and the captain would load up a small boat with our cameras and anything else we wanted with us on the island. At night the sea would get rough but it was manageable, except for the second night when it was so rough that everyone had to go to bed by 8:00 pm. It was hard to stay on our own mattresses with all of the back-and-forth rocking. The Captain told us the next morning that he had been very worried for our safety. The crew cooked mostly vegetarian food, except for one day when we got a little bit of chicken and fish that Gil from Belgium caught for us. The portions were rather small but just the right amount for each person, unless someone served a lot on their plate; which would pretty much leave the last person without food. Everyday we would get noodles, rice, cabbage salad and some type of Tofu dish with veggies. The cook would place the different trays of food on a mat on the floor and we would all jump on it like vultures fighting to get their fair portion. It was actually quite entertaining to watch! We were always so hungry! 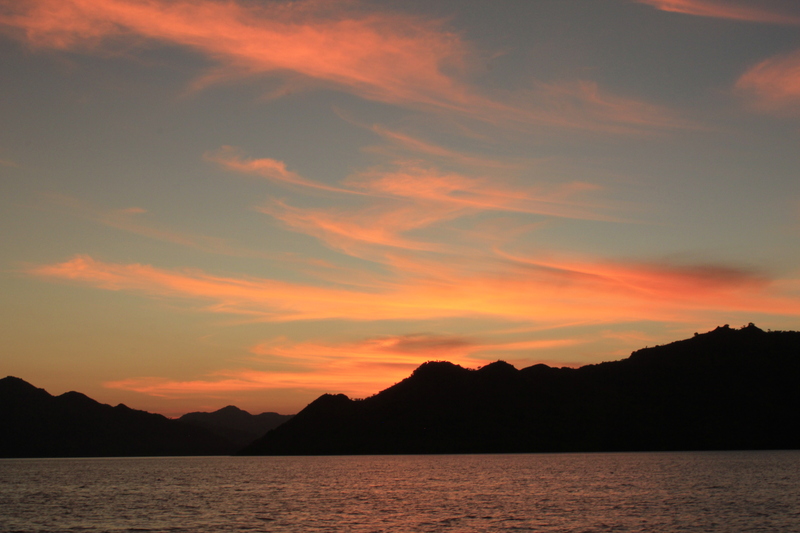 We spent our last night on the boat anchored in a bay near Komodo island. It was nice to be able to be still for a while but it also felt strange. We took advantage of this and had ourselves a little celebration; which included music on the boat’s big speakers, dancing and drinking. At one point, I had most of the group learning to dance salsa. There was a local guy on a small boat cruising around the bay and visiting all the tourist boats selling beer, peanuts and cigarettes. 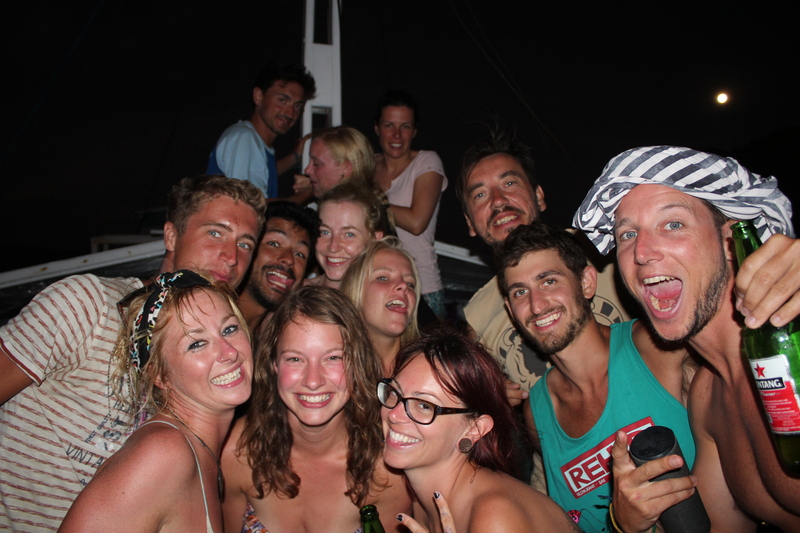 We had the most lively boat around the bay, with loud music and dancing. We even had visitors drop in from another boat. 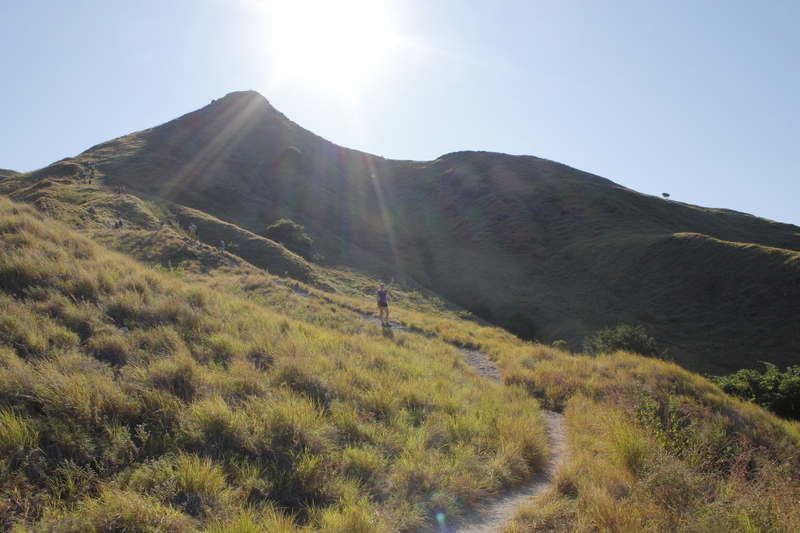 On the final day of our journey, we went straight to Rinca to do trekking and find the Komodo dragons in the wild. 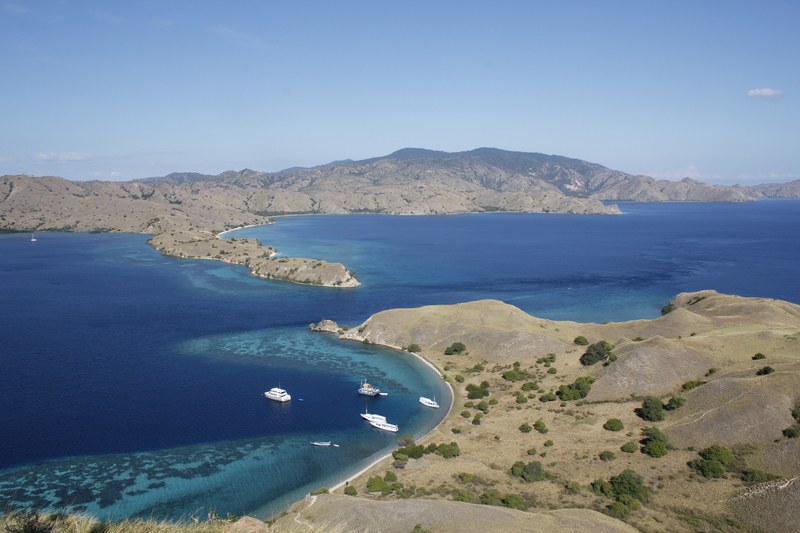 Rinca and Komodo are both inside Komodo National Park, declared one of the new seven wonders of nature. The Captain made the decision to skip our scheduled visit to Komodo island as we would only have a small window to catch the dragons while they sun-bathed in the morning. It was mating season and they only come out from 8 to 10 am. The chances of seeing them are higher in Rinca than in Komodo. This park is known for its dragons and its rich marine ecosystem. We were lucky enough to see six dragons. We even saw two mating; which is very rare according to the Captain. While the two dragons were mating, another bull dragon came to fight the other male to try to get the female. They actually didn’t fight but we got to see the bull chase the female around us. These dragons are very large and quite intimidating as one bite will deliver about 50 different types of bacteria into your bloodstream; which can kill you in a matter of two days. These animals live up to 50 yrs as they have no predators. Their gestation period is nine months. The female will protect the eggs from other dragons and other animals that try to eat them. Once the eggs hatch, the baby dragons have to run away as the mom will then try to eat them herself. The babies live up in the trees until they are three years of age, when they are strong enough to defend themselves. Very cannibalistic species. We enjoyed a nice hike on the island and got to see a couple of baby dragons. We stopped for some snorkeling after lunch. My friend Priscila from France guided me through the corals and found a lion fish, a blue and black-striped fish and lots of fish nests. It was one of the best snorkeling experiences I’ve had so far in Indonesia. 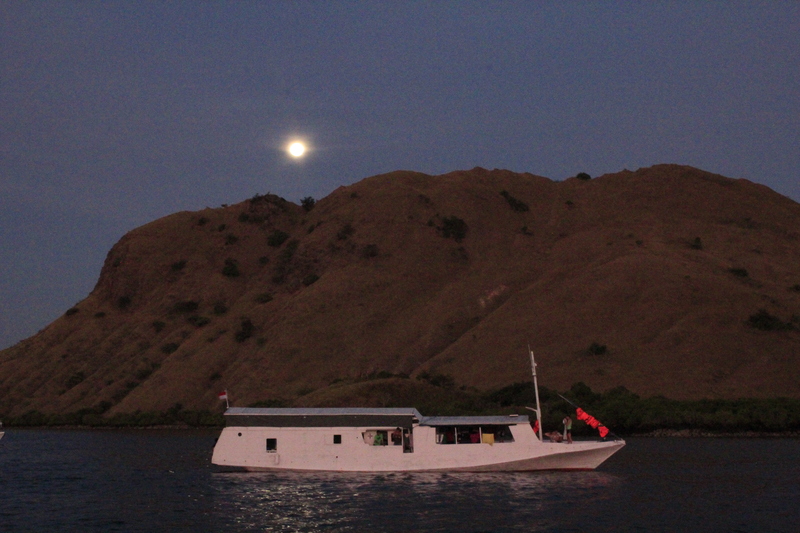 We later docked at Labuanbajo, the capital city of Flores. We had the option of staying another night on the boat but some of us opted to find a room in town to take showers. We all met in town for one last drink to say our goodbyes. I flew to Denpasar, Bali the next morning where I spent my final night in Indonesia. I splurged on a US$20 room with TV, AC, swimming pool and a nice “western” bathroom. clown fish playing with my gopro. These guys are feisty! My travels in Indonesia have sadly come to an end. There is soooo much to see and do in Indonesia that two months is not enough. I am still not done with this place so I will be back, at the very least to see Sulawesi and Papua. Spending a daily average of $15-$20 on room and food. The magnificent sunrises and sunsets. The cheap and yummy street food. The great travel companions that I met on every leg of the journey- very fun, well-rounded, smart, laid-back, down to earth people that are hungry for world knowledge. The views from the five volcanoes that I climbed. The beautiful, hospitable and kind people of Indonesia. The trash everywhere… on the streets, on the trails in the national parks and in the ocean. Being harassed a couple of times in Sumatra by men. This is a very strict muslim place where they still practice sharia law. They also seem to have a hard time accepting a woman in her late 30’s, not married and traveling alone. Well this could be the case in many countries I suppose… and this was expected in Sumatra, so not a big shock but uncomfortable nonetheless. The lack of toilet paper and soap in bathrooms and questionable hygiene practices. Overall, it was an amazing and beautiful archipelago with lots to see. I highly recommend it to any traveler who is looking for a little adventure and lots of natural beauty. TERIMA KASIH INDONESIA! SAMPAI JUMPA LAGI!